Weight matters and the longer the trip, the more aware of weight you become, particularly if you’re holding it all on your person. Weight also matters when it comes to the choices we make daily regarding what we “carry” with us as we go. Grudges, offenses, disappointments, dislikes, distrusts, anger, hurts, negativity, self-righteousness, mean-spiritedness, unhelpfulness, judgments, not willing, and self-centeredness are all on the packing list for each of us at some point. Imagine removing one of those heavier items from your pack. What would it feel like to no longer hold that grudge against your co-worker? Or what if you didn’t get upset when your ideas and solutions are dismissed, overlooked or disregarded? And what if that decision has nothing at all to do with you, anyway? When you slowly and intentionally unpack what you’re actually carrying you might be surprised to discover all the extras you have in your bag. And when you examine and remove each item separately, you might also be surprised at how relieved you feel. Additionally, you’ll find that carrying less weight allows you to navigate your days and weeks easier. You’re more flexible with your time and with yourself because you’re no longer using so much of your internal resources to avoid conversations, demand attention, gossip and spread your weight around as you seek validation and support for your decision to constantly carry it. Whatever I pack, I carry. When I pack only my essentials, and don’t worry or stress about the rest, I have the best trips. I’m carrying what I choose to carry — nothing more and nothing less. Your choice is no different: what you are carrying, you’ve packed and are repacking it daily to take it again, regardless of need. Growing up I had to pack my own lunch for school and I always packed the same thing: peanut butter and jelly sandwich plus some carrots. I loved that meal and I loved how simple it was. I never grew tired of eating the same thing every single day. Do you love what you’re packing and carrying? Can you happily continue packing, carrying and using the contents of your emotional bag? Is there anything you’d like to unpack? Let me be clear: you are the one who packs and carries for you. No one else is responsible for anything you’re carrying. If you’re carrying something you believe has been given to you against your wishes or without your consent and you can’t remove it, please reply to this email and tell me what it is. With all my heart I want to encourage you to look even closer at that item and see whether what you’re actually carrying is your own opinion (negative or otherwise) about an experience. 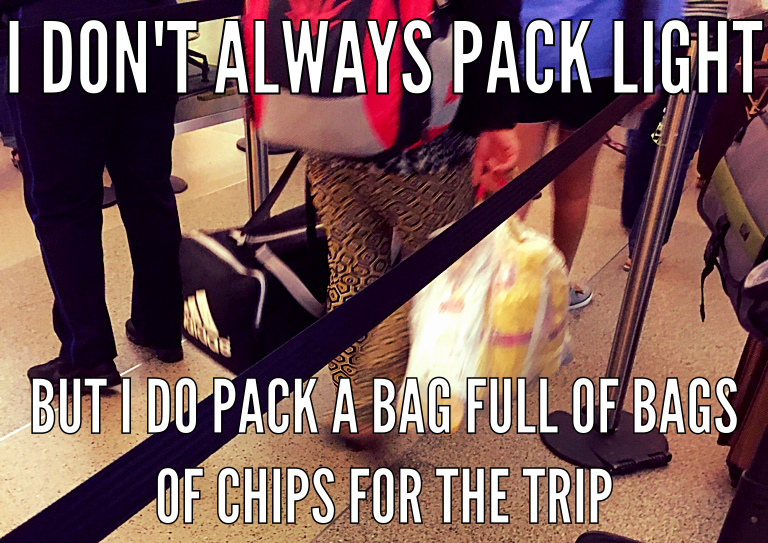 We can always work much easier on tidying up our own bags than reaching into someone else’s. May your travels today and this week be lighter than yesterday’s trip.